The unique marine ecosystem of today’s Antarctic seas first developed when large ice sheets formed on Antarctica around 34 million years ago, according to new research involving a scientist from the University of Southampton. The study, published this month in the journal Science, used the organic fossil remains of a type of single-celled marine plankton called dinoflagellates to identify when Antarctic plankton communities shifted to the present day makeup. Before the ice sheets formed, Antarctica was sub-tropical and ice-free, and the seas were inhabited by a diverse array of dinoflagellates characteristic of relatively warm climates. However, these results show that the emergence of the ice cap caused a step-change in the types of dinoflagellates living around Antarctica to predatory species that feed on photosynthetic algae such as diatoms. This indicates more productive conditions likely characterised by intense phytoplankton blooms which impacted the whole food chain, including larger organisms such as whales and penguins. “This study demonstrates that the initial large-scale glaciation of Antarctica had profound effects on plankton communities in the waters surrounding the continent,” says Dr Steven Bohaty, co-author and Postdoctoral Researcher in Palaeoceanography at the University of Southampton. The study shows that, by comparing the fossil record with reconstructions of palaeoclimatic conditions, scientists can identify critical points in the geological past when environmental and biological changes were linked. “These results provide evidence that the long-term evolution of Antarctic plankton communities was significantly impacted changes in climate on relatively short geological timescales,” adds Dr Bohaty, who is based at the National Oceanography Centre, Southampton (NOCS). The team studied fossilised plankton and sediment characteristics of cores collected from the seafloor along the Antarctic margin south of Australia in 2010 as part of the Integrated Ocean Drilling Program (IODP). This is the first time a long scientific drillcore has been collected from this region of the Antarctic margin. This discovery was made by an international team led by Utrecht University. 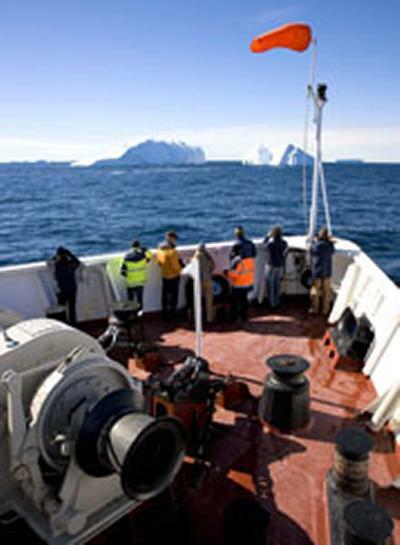 Cruise participation and research funding for Dr Bohaty was provided by the Natural Environment Research Council (NERC).